Iguaçu Falls, in the Iguaçu River, is, actually, a system of 275 falls along almost five kilometers in the Brazil-Argentina border. The highest fall is 64 meters high and the others has 30 to 40 meters high. 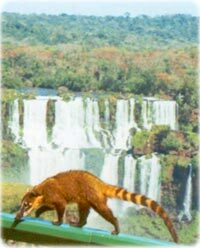 Both, Brazil and Argentina, surrounds the area with national parks, where several species of animals and plants can be found. 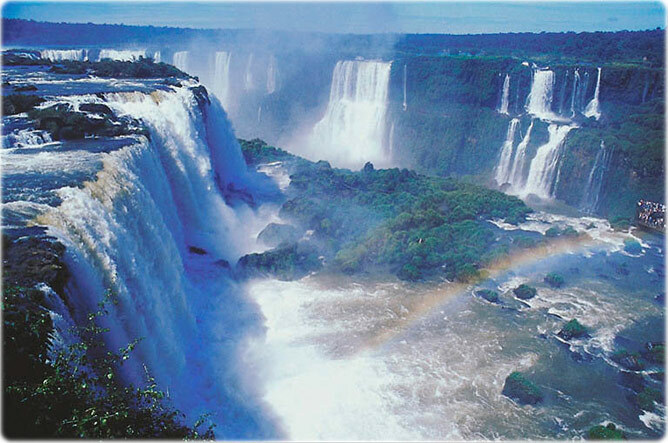 Iguaçu Falls was first seen by European people in 1542, when the expedition of Dom Alvar Nunez Cabeza de Vaca found it. Today, the region is the border among three countries: Brazil, Argentina and Paraguay, and can be reached by plane or through the Asunción-Paranaguá highway. Quati - One of the several species of animals in the Iguaçu National Park. The Park was created in 1939, in the West of the State of Paraná. It is the most famous park in Brazil and is annually visited by 700 thousand people, in average. Iguaçu Falls as seen from the Brazil's side.